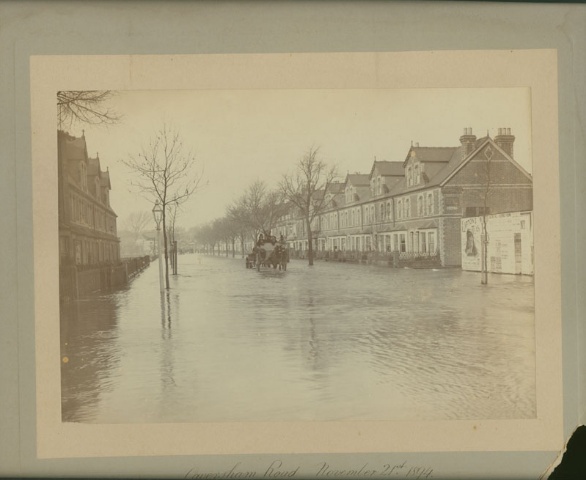 On the 26 days between 23 October and 17 November 1894, more than eight inches (200mm) of rain fell in the Thames Valley. The Berkshire Chronicle said that there had never been such a flood in Reading and neighbourhood in living memory. By 17 November the River Thames flood reached as far as Messrs Wheeler’s stonemasons yard on Caversham Road and up Great Knollys Street. Blake’s Cottages bedside the River Kennet were also submerged, and the inhabitants had to leave their lower rooms. Hundreds of families were forced to abandon their homes, while more had to reach theirs by boat and cart. Huntley & Palmers Biscuit Factory was flooded and the horses at Simonds Brewery had to be removed from the stables in Bridge Street. Communication with Caversham was only possible by means of vehicles and King’s Meadow, Caversham Meadows and Sonning Meadows were completely submerged, the Thames presenting the appearance of an inland lake stretching completely across to Lower Caversham.